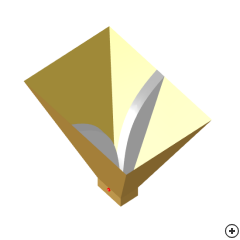 Image of the Pyramidal ridged horn. A common multi-octave bandwidth technique is to use a tapered ridge in the horn aperture, to serve as an impedance transition between the ridged waveguide feed and free-space. A double-ridge is used for single linear polarisation and a quad-ridge for dual linear or circular polarisation.